Thinking Pinoy: Bye-bye Trillanes? How far will Gordon’s ethics complaint go? Bye-bye Trillanes? How far will Gordon’s ethics complaint go? We are all familiar with Antonio Trillanes’ antics in the Senate. Looking back in history, I can recall that he has clashed with Senators Enrile, Sotto, Cayetano, Lacson, and Zubiri, to name a few. Trillanes got away with all of them, but it appears that he may not get away this time, when he insulted Senator Richard Gordon’s Blue Ribbon Committee, calling it a “comite de absuelto” during a 29 August 2017 senate hearing. This case is more important that most of us think. If Trillanes is expelled, there will only be 21 active senators left, making Comelec chair Andy Bautista's prospective impeachment trial more likely to result into a conviction, as explained in "Andy Bautista exit more likely after Hontiveros kidnapping stunt". I will not discuss anymore the “why” behind Senator Gordon’s prospective ethics complaint because I believe that the reader is already familiar with what kind of senator Trillanes is. Instead, I will attempt to explain the journey that Gordon’s complaint will take, along with the odds of it succeeding in expelling Trillanes from the Senate once and for all. Senator Gordon said he’s already preparing the ethics complaint against Senator Trillanes in as early as the evening of Thursday, 31 August 2017 [Politiko]. I expect him to file the complaint on Monday, 04 September, since 01 September is a public holiday. As expected, the Liberal Party-led minority bloc opposed Gordon’s plans per a statement signed by Senators Aquino, de Lima, Drilon, Hontiveros, and Pangilinan [News5]. Nothing new there. In an 01 September 2017 interview at [Karambola sa DWIZ], Gordon categorically said that his ethics complaint aims not at suspending Trillanes, but from expelling him from the organization for good. I have tried searching for past incidents where the Senate expelled one of its members but I haven’t found any, so this might be a historic first for the institution. Trillanes and Gordon have traded barbs [Politiko] since the fateful 29 August senate hearing and Gordon is showing no signs of backing down on his threat. Yes, I think Gordon will really file a complaint, so let’s assume that he indeed will, so what’s next? The Senate Ethics committee will receive Gordon’s complaint, a hearing (or several) will be held, and the committee members will vote by simple majority on whether the complaint will be endorsed to the plenary or not. Ethics committee chairman Tito Sotto is irked at Trillanes. 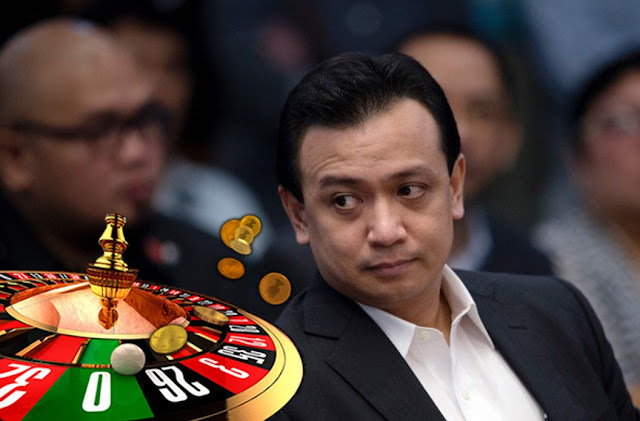 During the same 29 August hearing, Trillanes accused him of trying to prevent witnesses from testifying, to which he irritatedly replied, “I said, 'Pag-aralan muna ng committee sapagkat hearsay.' It doesn't mean na 'huwag'. Huwag mo 'kong pagbibintangan [TP]." Sotto will probably vote against Trillanes. Lacson isn’t very fond of Trillanes either. In July 2017, Trillanes called several majority bloc senators “cowards”. In response, Lacson said, “Calling one’s own colleagues ‘cowards’ or ‘puppets’ wholesale and without qualifying, is the darndest thing he can do [Inq].” Lacson is also part of the Senate Justice Committee, and he’s been witness to Trillanes’ maneuverings during the senate hearing on extrajudicial killings held in October of last year. Lacson will probably vote against Trillanes. Pacquiao will probably vote against Trillanes. Hontiveros and Trillanes will clearly vote against the ethics complaint, after Hontiveros previously signed a statement supporting Trillanes and Trillanes is not expected to vote against himself. Nothing surprising there. Poe said earlier today that the ethics complaint is unnecessary [Star], which I find perplexing. You see, everybody expects Poe to run in 2019, and I find it confusing that she has to release statements that will hurt her chances of getting re-elected. But she said what she said, so let’s just assume for now that she’ll vote against the complaint. Will Poe vote for or against the ethics complaint? Anything is possible at this moment. Grace, please think hard. Being clumped with Hontiveros and Trillanes will spell an end to your budding political career. Yes, it will end your career. I put the odds at 50% in favor of the ethics complaint, 50% against. The usually quiet Senator Gringo Honasan is another “wild card” because of his associations. On one hand, Trillanes was once a Honasan’s protégé. Honasan, himself a well-known coup plotter in the Cory Aquino years [LATimes], strongly supported Trillanes’ amnesty while the latter was still in jail for the failed 2003 Oakwood Mutiny [ABS]. On the other hand, he’s part of the three-senator Macho Bloc, the others being Lacson and Sotto, who are also members of the Senate Ethics Committee. Lacson and Sotto are likely to vote against Trillanes, and that fact can influence Honasan’s vote. Moreover, Duterte himself admitted to helping Honasan hide while the latter was still being hunted by previous governments [Star]. Does Gringo still have some sympathy left for Antonio, or will he side with his Macho peers? I put the odds at 70% in favor of the ethics complaint, 30% against. I expect Hontiveros and Trillanes to vote against the complaint. Sotto, Lacson, and Pacquiao will vote in favor of it. Thus, it’s up to Honasan and Poe for the clincher. Note, however, that only four (4) votes are needed for the ethics complaint to prosper, so only one pro-expulsion vote is required from Honasan and Poe. That is, I think the odds of Gordon’s complaint being endorsed to the Senate plenary are pretty good. Upon the recommendation of the Committee on Ethics and Privileges, the Senate may punish any Member for disorderly behavior and, with the concurrence of two-thirds (2/3) of the entire membership, suspend or expel a Member. A penalty of suspension shall not exceed sixty (60) calendar days. Note that Gordon is not seeking Trillanes’ suspension: he wants Trillanes expelled from the Senate.Based on this rule, after a majority of Senate Ethics Committee members vote in favor of Gordon’s ethics complaint, it’s time endorse the complaint to the senate plenary, i.e. the senate as a whole will vote on the ethics complaint. There are 22 active senators right now, as Senator De Lima is in detention for drug trafficking charges [GMA] and is thus unable to vote, while Senator Cayetano has resigned from the Senate after accepting his nomination as Foreign Affairs secretary [GMA]. Thus, two-thirds of 22 is 14.74, i.e. the ethics complaint needs affirmative votes from fifteen (15) senators. Before we go any further, let me be clear about one thing: this is Politics at work. We can choose to remain naïve by convincing ourselves about rainbows, butterflies, and unicorns, but the fact remains that in this issue – and for most political issues for that matter – political loyalties and personal political interests take primacy. Now that we got that settled, let’s move on with my predictions on voting behavior. Note that Ejercito has already expressed support for Gordon's complaint [MT]. So far, we have 10 votes in favor of expelling Trillanes, so we need five (5) more, and here’s where it gets interesting. The NPC bloc may note vote as one in light of Poe’s pronouncements against the ethics case, so let’s evaluate those who are likely to vote affirmative. Gordon is the complainant himself. This is a no-brainer. Legarda is generally pro-administration, though not as pro-administration as, say, Pacquiao or the former Senator Cayetano. With that said, however, Malacañang sources tell me that Legarda is being considered for nomination as Environment or Social Work secretary. If that’s the case, Legarda’s political interests suggest that she will likely vote in favor of the complaint. So far, we have 12 votes, so three more. De Lima also opposed the complaint but she won’t vote on it anyway because she’s currently detained in Camp Crame. Trillanes is also expected to vote against the measure. Meanwhile, Poe can swing both ways based on her recent statements. Escudero is another “unpredictable”, so I think that just like Poe, he can swing both ways. Gatchalian been generally neutral on Duterte’s policies so far. He publicly shared differing views on the South China Sea ruling, and he was one of the first to call for a review of Duterte’s martial law decalaration. Note, however, that he ended up backing the latter [Inq]. Moreover, Gatchialian has a pending graft case at the Sandiganbayan [Inq]. Thus, it may be in his political interest to side with Duterte, since that case will probably reach the Supreme Court. By the time that case reaches the high court, Duterte would have appointed at least ten SC associate justices [TP: SC Math]. I think Gatchalian’s odds would be just like Honasan’s in the committee level. Joel Villanueva, while still a member of the Liberal Party, is part of the Duterte-friendly majority bloc. Villanueva is generally seen to be pro-Duterte, after photos of Villanueva's father Bro. Eddie of the Jesus is Lord movement praying over Duterte surfaced online weeks prior to the elections. That is, I believe Eddie will exert influence on Joel’s vote. I think Villanueva’s odds would be just like Honasan’s in the committee level. Recto is generally cordial with Trillanes but Recto has joined the administration-friendly majority bloc several months ago [GMA]. In fairness to Recto, I think he is quite neutral and fair in his decisions, so he can swing both ways (50-50). Let’s summarize what we’ve discussed in the previous section. To recall, two of the 24 senators (De Lima and Cayetano) are out, so we’ll have 22 active senators in the plenary. The $64 Question: Backdoor Negotiations? Will Gordon use political capital to convince the senators? Will there be a rare display of decisiveness on the part of Poe? Will Joel Villanueva decide based on what his dad would want? Will Recto, after years of being an LP outcast, emancipate himself from the party’s clutches? Will the Duterte Administration influence the Senate? Your guess is as good as mine but whichever way it goes, I think that Trillanes’ immediate political survival is very seriously under threat. And here's a special message to Senator Poe: Your decision on this matter may make or break your political career, so please vote wisely. They nation's eyes are on you right now [TP].